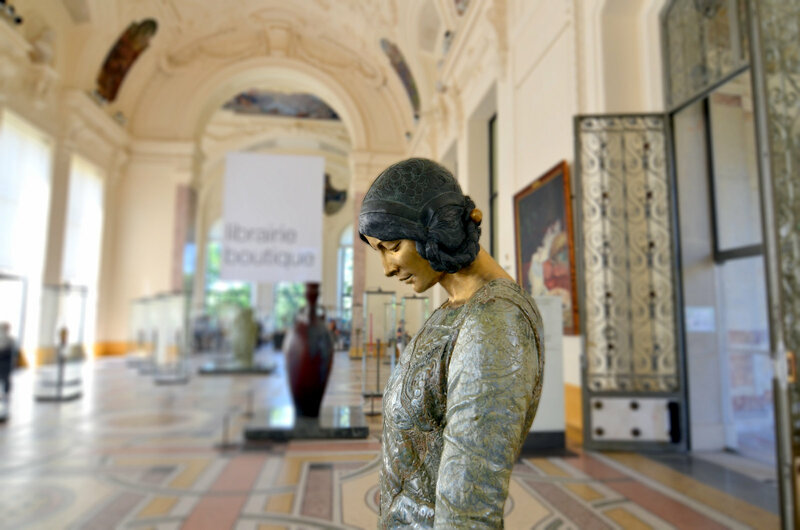 Whenever I want to take a little break from the city buzz without actually going away from Paris, I go to the Petit Palais, a fine arts museum located off the Champs Elysées. There you can enjoy a quick break and/or have a little snack in the in house café that I already recommended (especially in summer!) In the main entrance hall, they have a few pieces of art on display, including this one that I love: it's called La femme au singe (singe means monkey) for she has a monkey on a leash) and it was made by Camille Alaphilippe. An absolute beauty. I love the Petit Palais. The Sarah Bernhardt portrait is amazing. It's on my list for this year, but I don't know if La femme au singe will be there. I really love this scene. She looks so quiet and pretty. Shame we don't see the whole sculpture though; I guess the framing would be less captivating. She looks quite serene for someone with a monkey. Fortunately, it's on a leash and not on her back (which would be bad whichever way you take it).